Does Your Outrage Over Cecil the Lion Make Sense? 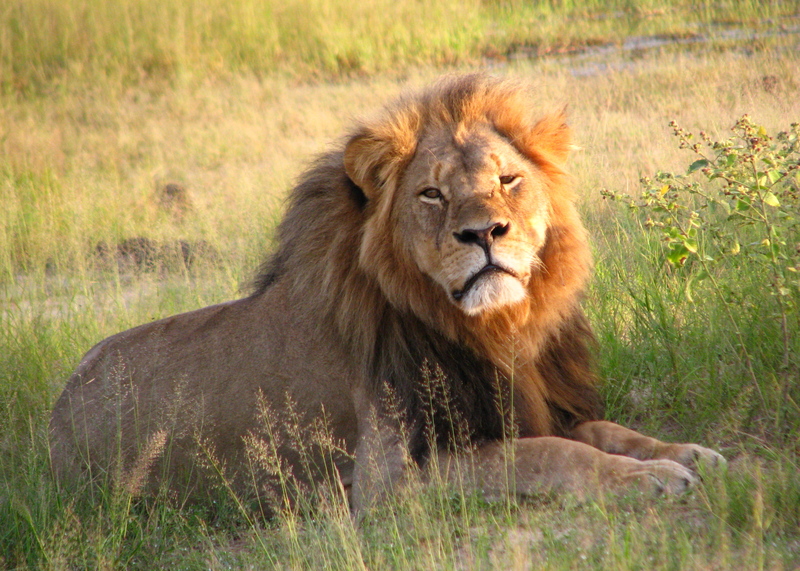 You are at:Home»News»Does Your Outrage Over Cecil the Lion Make Sense? I think hunting is stupid. I mean, I have many friends and family members who hunt, and I don’t have any ethical qualms about hunting in general. In fact, there seem to be plenty of circumstances where hunting could be seen as a “good” thing — where the hunted animal will serve to provide necessary food, clothing, etc. for the hunter — where the species being hunted is detrimentally overpopulating an area, or directly threatening the human population. I rant in the context of Walter Palmer and Cecil. For those in our reading audience who’ve just emerged from a fallout shelter, Walter Palmer, a dentist from Bloomington, arrowed, shot, beheaded and skinned a beloved Zimbabwean lion named Cecil last month during a hunting safari. While the dusty cloud of allegations has yet to fully settle and reveal the clear facts, the gist of the narrative as it stands involves Palmer’s well paid guides baiting the lion out of his protective sanctuary, Palmer shooting the lion with a crossbow, and later — 40 hours later — killing the wounded big cat with a gun shot. Palmer and his accomplices then decapitated Cecil, skinned him, and left the bare carcass to rot in the harsh African sun. News of this incident found its way into the global media cluster#%$& a couple weeks ago and, within hours, the world — led by Jimmy Kimmel and Betty White — was ready to collectively crucify Dr. Palmer for his crimes. Of course, I understand why people are upset — hell, it’s a damned upsetting story to any non-sociopath with a pulse — but can someone explain to me the ethical distinction between killing lions and killing, say, deer? How is Cecil different from the 1000’s of nameless deer, or turkeys, who are killed in Minnesota every year? Or what about eating meat in general — meat that comes from animals that met their demise prematurely so that you could enjoy a meal. How is that fundamentally different from the hunting deaths of lions or deer? Have the people who are in a rage over Cecil ever seen a deer fatally wounded by a bullet and then immediately field dressed (i.e. gutted)? Are they familiar with the inner workings of a beef/pork processing plant (i.e. slaughter house)? Why, oh why, has the world become obsessively angry over this particular animal losing its life, when the world is chock full of animals losing their life and so few seem to give a damn? I hold that only the Anti-Hunting, Vegetarians/Vegans (represented by the * ) are justified in their moral outrage over Cecil the lion’s death. The rest of ya’ll need to calm down. A — To those who are mad as hell about Cecil, BUT eat meat AND are pro hunting: Stop being outraged immediately. No more posting Cecil stuff on Facebook. 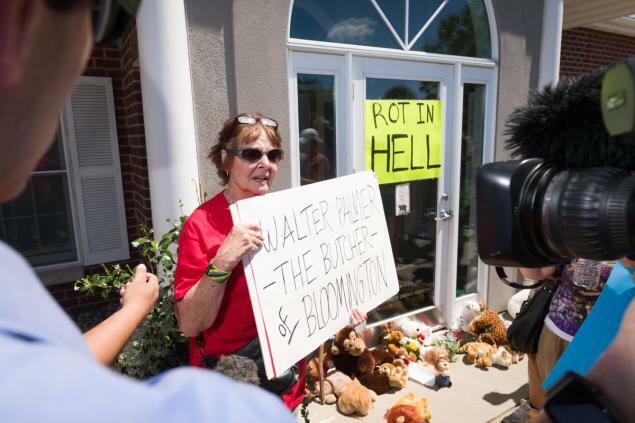 No more Tweets about how Walter Palmer is Satan. You’ve been duped by the unstoppable momentum of the social media hivemind into getting rabidly mad about something you, as evidenced by your own actions, don’t actually care that much about. Righteous anger can be cathartic and kinda fun, but it’s time to get over it and move on with your life. Have a burger and rent Deer Hunter. It’s some of DeNiro’s finest work. B — To those who are outraged by Cecil AND hunting, BUT not eating meat: Tone down your outrage a smidge — your hypocrisy is showing. Google “video of a slaughterhouse” (Here’s a link to a whole bunch of them courtesy of the Humane Society. *NSFW warning*) and then come back and try to make a valid argument that Cecil’s death (or any other animals’ death via hunter) was ethically worse than what animals endure on the way to your dinner plate. C — To those who are outraged by Cecil’s death AND meat eating, BUT not hunting in general: What a wonderfully strange and ironic position you hold! You are aware lions are meat eaters, right? D — To those outraged by hunting AND meat eating, BUT not by the particular death of Cecil… What do you have against lions? To everyone, regardless of your views on Cecil, hunting or meat eating: There are far greater problems in the world for us all to care about. The treatment of animals writ large is an important ethical issue for each of us weigh within our own minds. Maybe this would be a good time for you to give vegetarianism a try? Or for those of you (like me) not ready to eschew meat, maybe do some research into which restaurants and meat producers concern themselves with ethical treatment of animals? 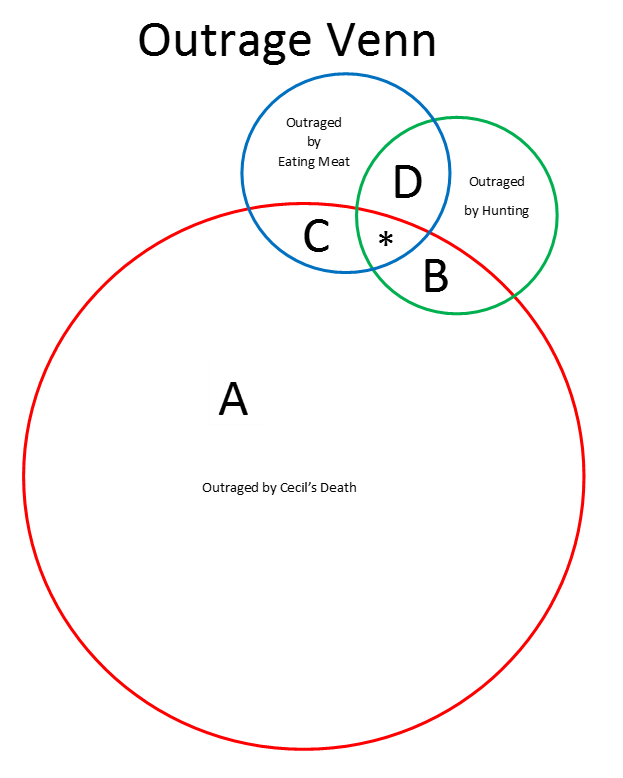 But, again, let’s apply some perspective. There are multiple wars and genocides taking place in our world as we speak — or rather as we argue about a dead lion and a compensating dentist.